I noticed that despite a big PR campaign and plenty of hype around MusicHub, if you Google’d any keywords relating to eircom music hub, the site wouldn’t show up in results. That’s because it wasn’t even indexed by Google. To me, it’s things like that which are an indication of bigger problems. A lack of attention to detail… a small oversight perhaps to the people working on it, but a big problem for their target market. Lost opportunity… an opportunity I accidentally capitalised on because having blogged about why I thought it would fail, my blog post was top of the pile in Google for searches relating to MusicHub, which lead to some unhappy Eircom people discovering my post and then trying to pour cold water on it. The question is, why couldn’t they see this coming and what made them think MusicHub would outmuscle the competition? Remember, this service was launched the very same day a similar service was shut down in the UK by Sky. Virgin had also pulled out of a deal in the UK to launch a MusicHub-like service. Instead, they partnered with Spotify. It was always going to me a mammoth task to infiltrate and dominate this space and from Day 1 the writing was on the wall. MusicHub could possibly have saved itself had it introduced features customer demanded but as usual, they were too slow and too reluctant to aggressively investigate & act upon all concerns & suggestions. 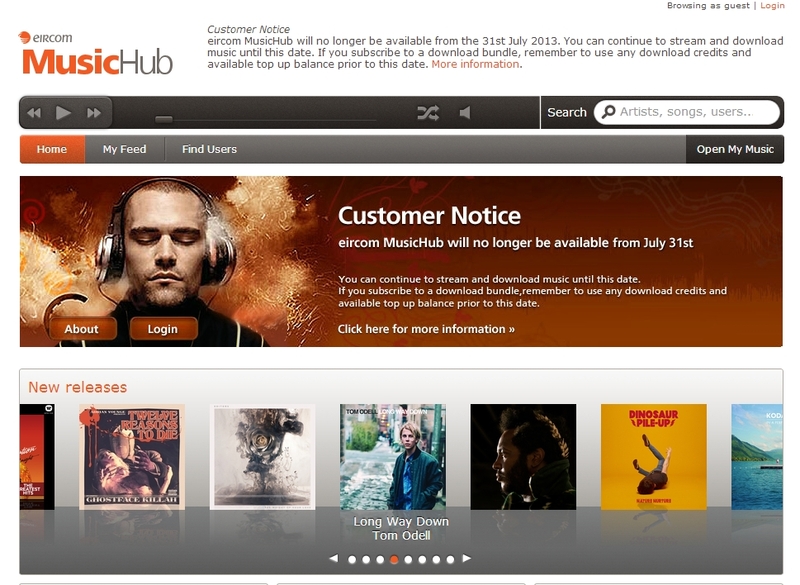 A month after that post in late May, rumours emerged that Eircom was to shut down MusicHub. So my guess is that Eircom knew a long time ago that no further development or investment would be made in MusicHub, yet continued to palm customers off with vague ‘yeah we’re working on it’ responses. Anyway, the moral of the story is “don’t get involved in things you know nothing about”. There’s a very high chance you’ll end up doing a MusicHub.